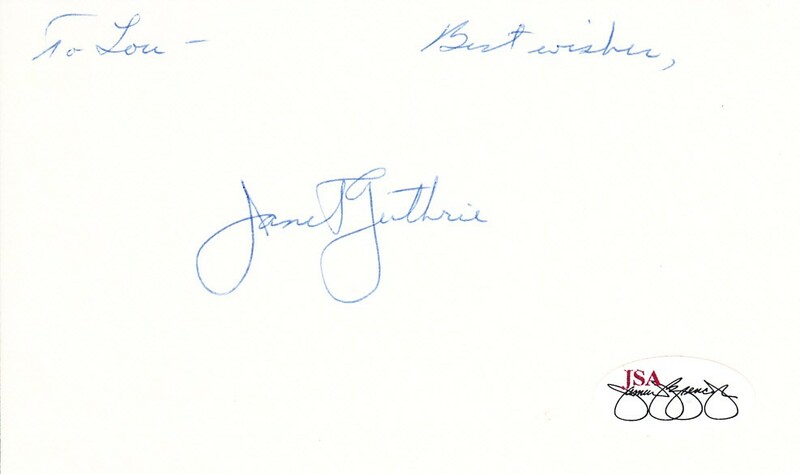 Unlined 3x5 inch index card autographed in blue ballpoint by auto racing pioneer Janet Guthrie (inscribed To Lou - Best wishes), the first woman to race in the Daytona 500 and Indianapolis 500. Authenticated by JSA with their Stamp of Approval unnumbered sticker and certificate of authenticity from AutographsForSale.com. Index card has minor corner wear. ONLY ONE AVAILABLE FOR SALE.